ONE-TWO-THREE: Joe Root, Kane Williamson and Jonny Bairstow were the three victims in Jordan Clark's memorable hat-trick at Old Trafford. Picture: Steve Riding. HAS THERE ever been a more prestigious hat-trick in cricketing history? 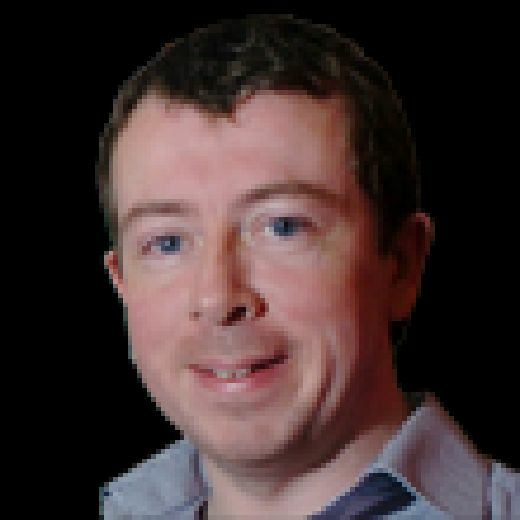 One has to wonder given that Jordan Clark bagged the prize scalps of Joe Root, Kane Williamson and Jonny Bairstow, ranked numbers three, four and 16 respectively in the world Test rankings. The Lancashire all-rounder, who famously hit six sixes in an over off the Yorkshire left-arm spinner Gurman Randhawa at Scarborough in a second team game in 2013, became the first man to take a Roses Championship hat-trick for 50 years when he performed the feat just before lunch on the opening day. The 27-year-old medium-pacer had Root lbw pushing forward to one that nipped back – the fourth delivery of his second over from the Brian Statham end – before trapping the creasebound Williamson. 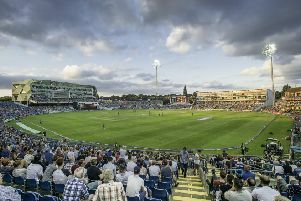 A leaden-footed off-drive from Bairstow, smartly taken at third slip by Jos Buttler, sparked gasps of astonishment among the 2,500 crowd as Clark claimed the first Roses Championship hat-trick since Lancashire’s Ken Higgs at Headingley in 1968, and only the second since Yorkshire’s George Macaulay at Old Trafford in 1933, Macaulay’s coming during a sequence of four wickets in five deliveries. Clark ended with a career-best 5-58 as Yorkshire were dismissed for 192 after winning the toss, Adam Lyth top-scoring with 70 from 119 balls. Lancashire's Jordan Clark is mobbed by his team-mates. Picture: Steve Riding. It was another below-par batting performance from a side who suffer them on all-too-regular basis, and seemingly regardless of the personnel at their disposal, but was put into much more favourable context by a rousing fightback with the ball. Ben Coad, the 24-year-old pace bowler, captured three wickets in five balls as Lancashire collapsed from 92-4 to 109-9, thereby concluding their innings as captain Liam Livingstone was unable to bat after suffering a fractured left thumb while fielding. “We’re delighted with where we stand,” reflected Yorkshire captain Steve Patterson, whose side hold a lead of 83. “We feel we can bat better in the second innings. We were 59-1 and set up nicely, but Clark got his hat-trick and to lose three players of that calibre is a killer. It’s probably one of the best hat-tricks ever based on the names he got out. Clark described himself as“over the moon” but said “it sort of took the sting out of it the way we’ve gone with the bat”. He added that “we’ve got a big opportunity (on day two) to turn it around”, but the fact is that Yorkshire are now in charge of a match between two sides seeking to pull clear of relegation trouble. Clark’s feat came during a 15-minute extension to the first session after the start had been delayed by 45 minutes due to rain. Root had hit Clark’s previous two balls to the offside boundary, the England Test captain once again looking in good order after successive unbeaten scores of 113, 100 and 51 in white-ball cricket, only for Yorkshire to slip from 59-1 to 59-4 beneath leaden skies. LEADING LIGHT: Adam Lyth top-scored for Yorkshire with a well-constructed 70 at Old trafford. Picture: Steve Riding. The ball swung throughout, not least in the hands of England pace bowler James Anderson, but Lyth and Root had appeared in watchful control after Harry Brook fell 55 minutes in, playing-on as he tried to withdraw his bat to a ball from Graham Onions. After the dramatic climax to the first session, the afternoon began badly for Yorkshire too when Gary Ballance shouldered arms to Onions and was bowled before Tim Bresnan was run-out at the non-striker’s end to leave them 86-6. If Clark did not already know that it was his day, he certainly did when he thrust out a hopeful right hand in trying to stop a firm drive from Lyth and accidentally diverted the ball on to the stumps from an improbable angle with Bresnan stranded. After Lyth and Patterson added 45 for the seventh wicket, Patterson edged to Keaton Jennings at first slip – as did Lyth when the next ball from Anderson kissed the edge. Lyth’s innings showed what was possible with a combination of skill and application, qualities that he rarely lacks when he visits Old Trafford, scene of his highest score in the Championship (251) and also in one-day cricket (144). 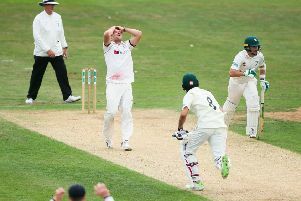 Clark returned after tea to have Jack Brooks caught at cover and then bowled Coad to bag his maiden five-fer, leg-spinner Josh Poysden – signed on loan from Warwickshire for this match – finishing unbeaten on 20. When Lancashire batted, the sun broke through and conditions became increasingly warm. There was still a bit of movement but there were runs to be had as openers Keaton Jennings and Alex Davies proved. The pair had quite comfortably raised 46 inside 15 overs when Jennings fell to an astonishing catch by Root, the batsman bludgeoning a long-hop from Bresnan to short mid-wicket, where Root somehow plucked it from the air one-handed as he flew to his left. It was a moment of pure inspiration, and two more wickets came on the back of it when Patterson bowled Haseeb Hameed and trapped Dane Vilas. The hosts’ plight worsened when Buttler was strangled down the leg-side by Bresnan, Coad then striking with the second, fourth and sixth deliveries of his seventh over when he had Davies caught behind for 51 before bowling Bailey and Onions. Brooks rounded it off by having Clark caught at deep square and pinning Anderson, with Clark’s hat-trick potentially destined to be in a losing cause.